Since the number of characters for a code is limited to 63, longer code designations can be assigned as code aliases. For example, they may be exported instead of the code names when using the Smart Publisher. A color attribute can be assigned to each code or subcode. 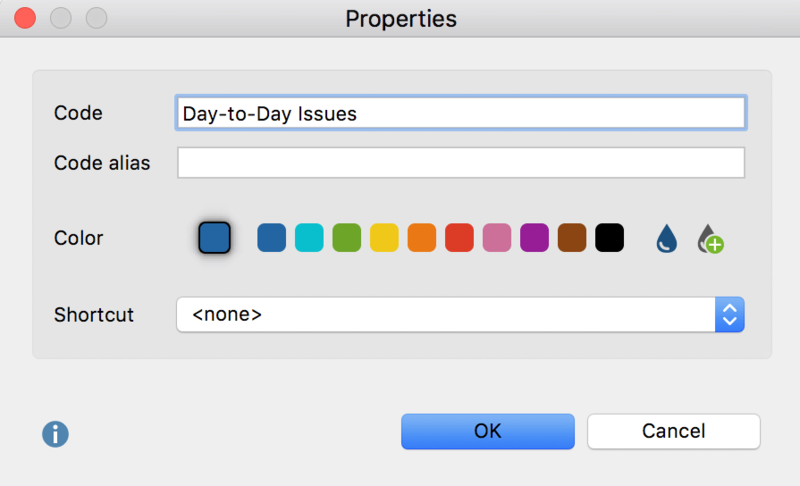 To do this, right-click on a code and click on one of the default colors in the context menu. 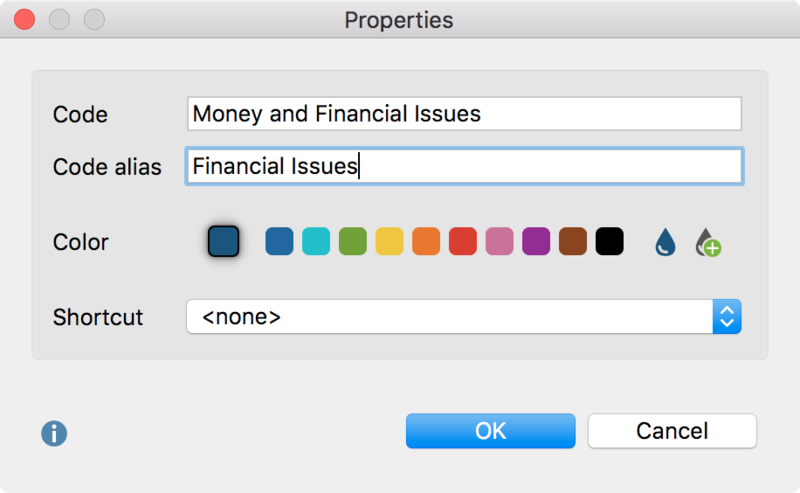 The icons on the right-hand side of the context menu allow you to define your own colors and list the colors already used in the project. 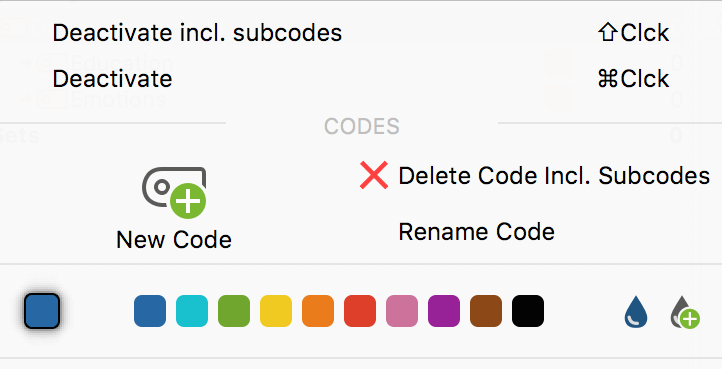 Tip: If you change the color of a parent code, MAXQDA asks if you want to apply the Color to all the subcodes as well. The color is visualized in the “Document Browser” and in visualizations created with the Visual Tools. In the “Document Browser” the coding stripes are displayed in the corresponding code color. This makes it easy to identify which segments are assigned to a code. 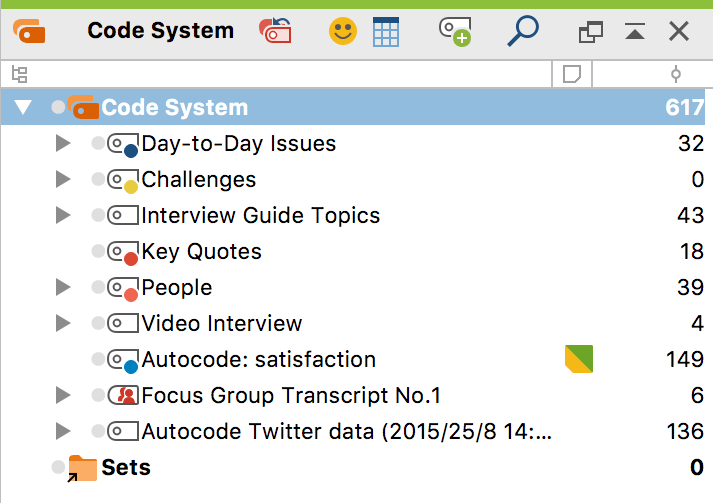 The color is also seen in the bottom right of the icon next to each code in the “Code System”. The color attribute is also displayed in all MAXQDA tables that contain codes, e.g. in the “Overview of coded segments” table that is available for each document group and each document. There, the color attribute may be used as a criterion for sorting the table. This is done by clicking on the column header of the column containing the colored icons. Unless you have changed the order of the table’s columns, this column will be the first one in the table. The color attribute plays an important role in all visual tools of MAXQDA. For instance, the Document Portrait is based completely on the colors of the codes that are assigned to a particular document. Thus, the selection of colors is an important step: colors should be assigned according to the kind of analysis that you plan to conduct. For instance, a psychologist could assign red colors to aggressive statements and green colors to friendly statements. When analyzing documents in regard to the topics mentioned a meaningful association of topics and codes is recommended. Thus, you are able to identify topics and combinations of topics with one glance. When working with focus groups, you should associate the speakers with the different colors, in order to quickly find out when a person is speaking. Code names in MAXQDA can be 63 characters in length. However, it is sometimes desirable to note a shorter or longer description in addition to the code name. This allows you to employ an automatically generated report with selected coded segments, for example in Smart Publisher. To create a code alias for a code, right-click on the code in the Code System and select “Properties”. This will open a window where you can enter a code alias, among other options. Alternatively, you can click Code Alias Table in the Codes tab, which will generate a table in which you can conveniently enter multiple code aliases, and view for which codes an alias has already been assigned.